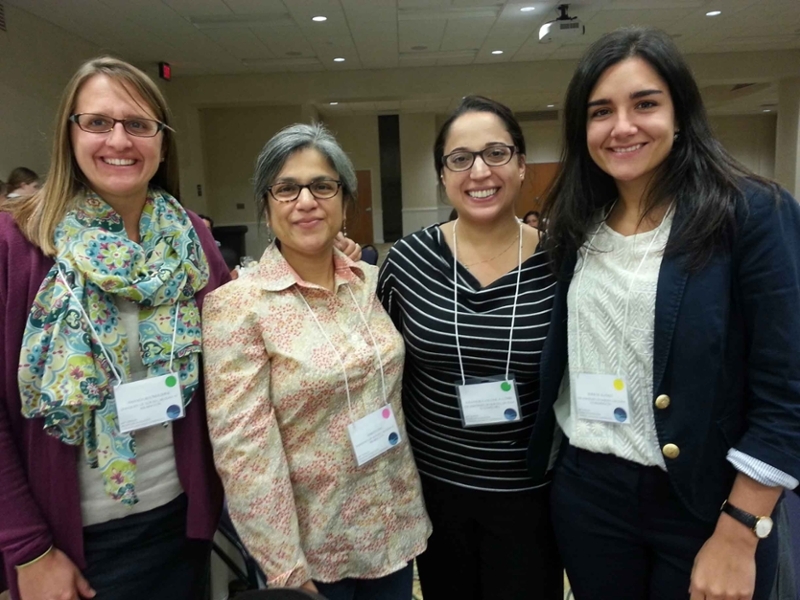 (L-R) Professors Amanda Boomershine and Amrita Das with alumna Alex Combs and current student Edurne Alonso at the MIFLC Conference. to produce professionals capable of dealing with the demands brought by the ever-increasing U.S. Hispanic population and by the global job market. The M.A. program requires a minimum of 30 semester hours of graduate study and the successful completion of capstone written and oral individualized comprehensive exams based on coursework. Students may choose between a thesis or non-thesis option. The remaining 21 credit hours are electives which can be from additional course above as well as courses in film studies, US Latino culture and literature, cultural studies, pedagogy, among other topics. Students enroll in 3 credit hours of SPN 599 (Thesis) and successfully defend thesis. The remaining 18 credit hours are electives which can be from additional course above as well as courses in film studies, US Latino culture and literature, cultural studies, pedagogy, among other topics. If you are considering applying to join our program, we invite you to consult the detailed information on our HOW TO APPLY page. The application deadline for fall admission is midnight eastern time May 15 (midnight eastern time March 1 for priority consideration for financial aid and assistantships). For spring admission, the application deadline is midnight eastern time November 1. We also offer summer admission and non-degree admission under certain situations. Please contact the Graduate Coordinator if you have any admissions related inquiries. We look forward to helping you throughout the application process. SLO 1: Be able to write a research paper or opinion piece in Spanish, with highly advanced use of language, tone, style, register and critical apparatus. SLO2: Be able to read, understand and utilize texts in Spanish at a highly advanced level. They will be able to manage and interpret primary resources in Spanish as well as secondary resources in Spanish (such as articles in professional journals). SLO 3: Be able effectively to communicate their thoughts with highly advanced fluency and accuracy of spoken language. They will be able to communicate concrete and abstract ideas in such a way that educated native speakers of the language will have no problem understanding. They will be able to speak on an array of academic topics as well as personal and professional matters and be clearly understood by native speakers of the language. They will be able to sustain extended discourse in order to effectively to state and defend an opinion. SLO 4: Be able to comprehend ideas expressed orally at a normal pace in standard dialect including, but not limited to, ideas pertaining to academic and professional topics. They will have very good understanding of standard idioms, colloquialisms, and cultural inferences delivered at a normal speaking pace.